Photography is very much about having the right tool at the right time... and knowing what to do with it. Obviously the camera body and the lens are the two most important instruments, closely followed (depending on your methods) by a tripod and external flash. But what about all those inexpensive little things that make the job easier? I thought I'd empty my camera bag and have a look at what I have accumulated. As usual, you can click through the image above to get a better look in Flickr. 1. A cheap mini-tripod. These cost far too much in most camera shops, but online, direct from Hong Kong, units like the metal tripod on the right cost pennies. The larger tripod with the padded flexible legs was a score for under a tenner at a local Lidl. These might be too wimpy for your full-frame camera, but work just fine with the Micro-Four-Thirds units I carry with me every day. 2. A remote shutter release. Again, buy online for a few clams. (A "clam", AKA a "buck", is an interchangeable unit of currency variously equivalent to a dollar, pound, or Euro.) These allow you to trigger your camera when on a tripod, without disturbance. Alternatively, use the release timer on the camera itself. 3. High-quality ND and CP filters. You need a Neutral Density filter to shoot low depth of field in bright light, or to slow exposure enough to make water nice and smooth. You need a Circular Polariser to kill reflections from glass or water, and to reduce glare from foliage and so on. Though NDs come in various strengths, I find the ND8, which reduces light three stops, is the only variety I need. I know the title of this article says "inexpensive" but, believe me, your garden variety eBay filters are not worth wasting money on. Brands like B+W and Heliopan are top-of-the-line but scientific tests (you can find them online) indicate they are not worth the premium. I have found that the Marumi DHG line punches well above its weight. I bought the "Marumi DHG Light Control ND 8" and the "Marumi DHG Circular PL(D)" in 49mm size for £50 including shipping. That makes these the most expensive item here. But worth it for the flexibility and control they grant. 4. To save money you should buy your filters in the largest size you will commonly need, and then purchase a variety of step-up rings to enable your other lenses to use them. For example, the Olympus M.Zuiko 45mm takes a 37mm filter. The Panasonic Leica 14mm and Panasonic Lumix 20mm take 46mm filters. I also commonly adapt a couple of PEN F lenses that use 43mm filters, plus Pentax lenses like the FA77 Limited, which come in at 49mm. For this reason I standardised on 49mm filters. Then I bought three step-up rings: 37-49, 43-49, 46-49. Voila! All these lenses can now use the same filters. Of course there are practical limits to this technique. I have a Pentax lens with a 77mm filter ring. This doesn't mean I am going to standardise on 77mm filters, because they would be pretty unwieldy on the smaller lenses. Still, I imagine that most people will need one or two filter sizes at the most. 5. If you use filters often, it may be easier to get step-up rings for all your lenses, so you don't ever have to take them off. Of course this means that the standard lens hoods will no longer fit, so I recommend obtaining slim-profile metal hoods. These are hard to find from discount sellers, who instead offer wide-angle hoods (which are cup-shaped), vented hoods (for range-finders), rubber hoods, and long hoods for telephoto lenses. While all of these will work, I prefer to save bulk and keep my system slim. This means buying a rather dear Heliopan short metal hood for about £16. If anyone can find a good replacement at half the price, please leave a comment! 6. And then you will need 49mm lens caps too. Plastic pinch-caps are the cheapest and easiest to find. 7. 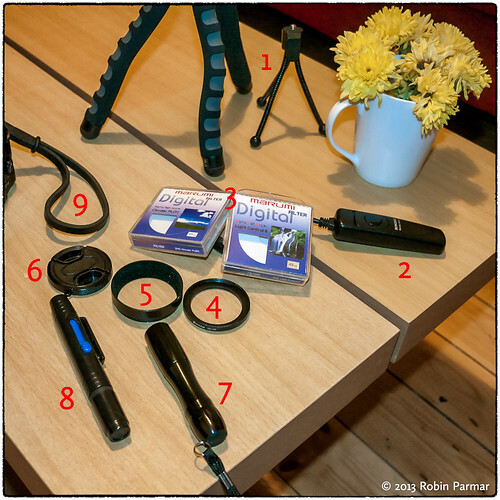 A small pen light makes it easy to find all your accessories in your camera bag. Plus you can adjust camera settings in the dark. Or find your keys. Essential! 8. A lens pen is the easiest and best way to clean your glass. This tool has a brush on one end and a fibre tip on the other. This is far handier than a lens cloth, which will accumulate grease from your hands. I have tried cheap lens pens that I wouldn't recommend, as they seem to smear or leave residue. Currently I haven't found an inexpensive brand that still maintains quality -- readers help me out! 9. Finally, there's the little matter of holding onto your camera. In my opinion neck straps are for the birds. I prefer my camera either a) out of the way, protected in a bag, or b) in my hand, ready to shoot. Wearing a camera around my neck so it can bump into things doesn't work for me. I recommend Gordy's Camera Straps since they look great, are tough as nails (well, tough as leather, anyway), and can be customised to taste. At $18 including shipping they are a value proposition. I am sure I have forgotten something obvious, but these are the accessories I found I was actually using. The rest are not worth mentioning. Update: I just noticed that Gordy now charges for shipping, nearly $7 to Ireland. Well, I can't blame him; it's those crazy USPS rates. Unfortunately buying a single strap is no longer an impulse purchase. I now recommend going in with friends to share the shipping charge (it's a flat rate). 10. A small SD card reader, so I can plug into any available USB slot and back up my images. 11. When on the road: A high capacity USB stick so I can make a safe copy of my files, even if I don't have access to the internet, a DVD burner, etc. All I need is a computer with two free USB ports (one for the card reader above). 11a.) on cheaper, slower cards.You might think the difference is not worth mentioning, but on everyday use I only have a very small bag, just for the camera, teh EVF, one (or two) spare batteries and a spare card and the reader.